I am on Skomer for three weeks now. 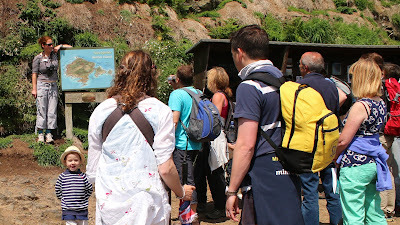 June is the busiest month on the island with visitors and breeding birds. As Seabird Volunteer I am an extra help for the main breeding season. My name is Magdalena (Magda). I am from the northern part of Germany and currently studying Biology at the University of Hamburg. For my master’s thesis I analyse the foraging behaviour of two different wader species in the Wadden Sea: the Dunlin and the Red Knot. 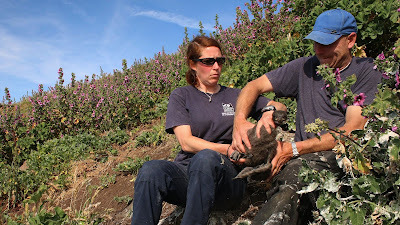 I always wanted to go to an Island for a longer period to get inside on what is required to keep a place like Skomer running. Normally you must stay for at least three months. 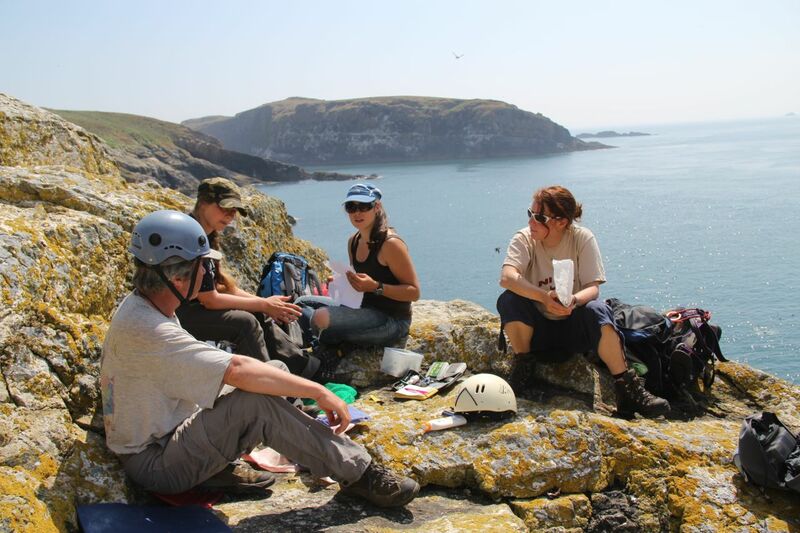 Being on Skomer as the Seabird Volunteer is a nice opportunity for me to live on an Island for five weeks, to learn more about monitoring birds and to get experience in practical conservation. 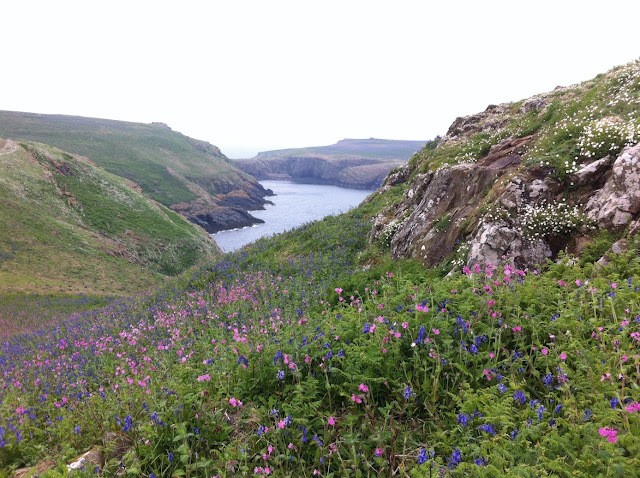 When I first arrived on Skomer the Bluebells and the Red Campion were forming a blue pinkish carpet on the whole Island. Many butterflies and moths can be found and, of course, there are the birds!I am involved in everything which is connected to the whole island seabird counts - including counts from a boat, counts from land, the Manx Shearwater census and data entry. But of course, there are more things were help is needed e.g. chicks of many bird species get ringed. The Manx Shearwater census has a special addition this year. Apart from the annual census there is a whole island census, which recently came to an end. The whole island census had about 300 plots and there were six people who spend one to three weeks on the Island only for the census. In total they invested about 500 men hours crawling over the Island in all weathers. How does the Manx Shearwater census work? 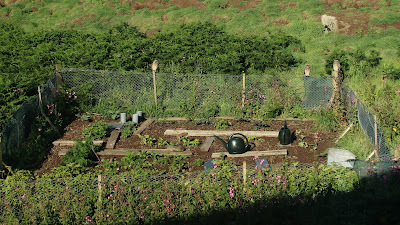 For the annual census there are 18 plots which we use each year. To find them they are marked with a metal cane and a GPS point. We use 25 m ropes. With the first rope we mark North and each person uses one rope to walk from the cane outwards forming many pie-like pieces. We work clock wise and, using MP3-players, we play a territorial call of the Manx Shearwater for 10 seconds down every burrow, waiting another 10 seconds for the bird to respond. We use two different clickers - one for a positive response and another one for a negative response. As for burrows, we only count those which have a real breeding chamber and are not only a tunnel. We must make sure that we count burrows with two entrances only as one. Another difficulty is a double response. When there are two birds calling you must find out whether there are two burrows or two birds in one burrow. Having finished all 18 plots it’s no surprise that some of us can mimic a Manxie call almost perfectly. Or is it because my “hutmate” Dulcie and I hear them all day AND all night...? 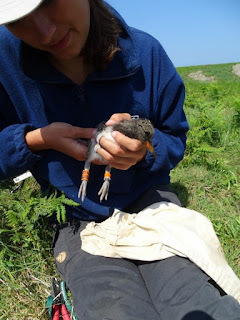 Our evening hobby is Oystercatcher ringing. There are many Oystercatcher breeding pairs on the Island, which all have chicks in a ring-able or almost ring-able age by now. The chicks must be big enough so that the rings don’t go off and if they are to big they might be able to fly and impossible to catch. That’s why the age of one to two weeks is perfect for ringing. But it is very difficult to find them. As soon as they hatch they are relatively mobile and hide under high vegetation. When we see a bird, we must be very fast, if we are to slow they will run and hide otherwise they will crouch. And then we must find the perfectly camouflaged chick, which is impossible if we haven’t seen were it went. Until today we managed to find six of them. All have got new shiny orange and metal bracelets. There are only two weeks left until I will return to Germany. I am looking forward to the rest of my stay. It comes with mixed feelings that Bee and I say goodbye to Skomer Island and move on to pastures new at the end of this year. The last six years have been an eclectic whirl of seabirds, people, seals and lots of hard work. It has been a great privilege to work on such an amazing site and live amongst its numerous wild inhabitants. We have met so many wonderful people and built so many meaningful friendships that leaving will come with a touch of sadness. Without some of these people the job would have been impossible and we would like to acknowledge them if we can. 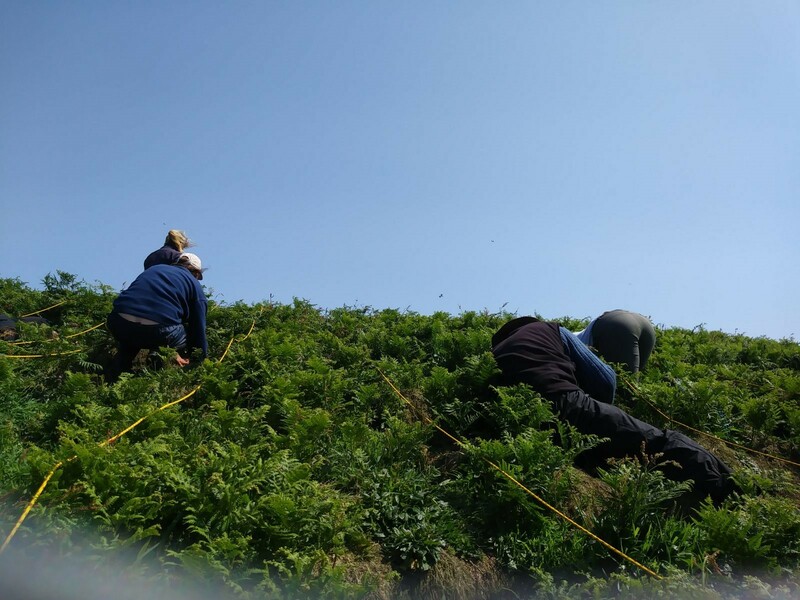 We would like to thank, all of the Long-term Volunteers, Weekly Volunteers, Work Party Volunteers, Assistant Wardens, Visitor Officers, Field Workers, the Lockley Lodge team and all other Trust staff that we have worked alongside. 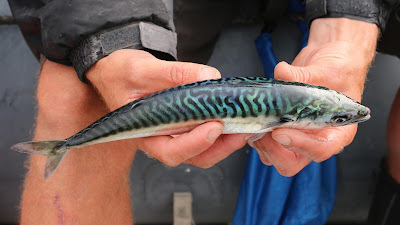 Also the Skomer Marine Conservation Zone team, the Friends of the Islands, members of the Islands Advisory Committee, the Trustees of the Wildlife Trust of South and West Wales (a couple of very special ones in particular), Dale Sailing (as long as they loose the Skomer games this year! ), all of the researchers who work on the island, donors to the Trust and of course all of the lovely visitors (both overnighters and day visitors) we have met over the years. On top of all of that there are the staff on other Pembrokeshire islands, the Marloes Parish Council, too many local people to name, local farmers, some ex-Skomer Wardens and the volunteers at the Wooltack Point coastguard lookout, amongst many, many others. 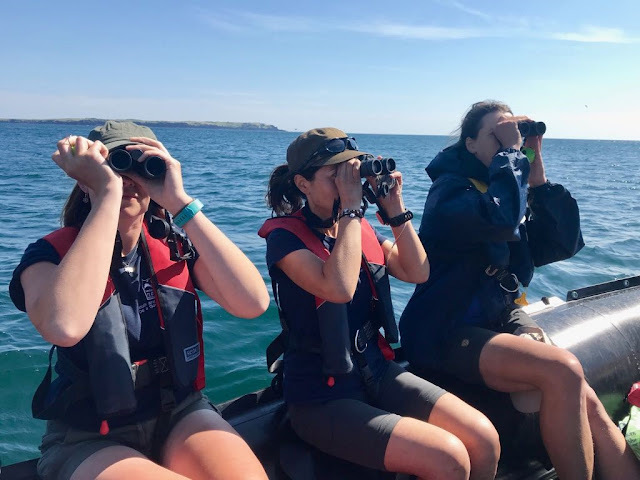 The island will definitely need continued support if it is to remain the amazing and world leading wildlife destination and research hotspot that it currently is and the new Wardens will need as much moral support as people can offer. 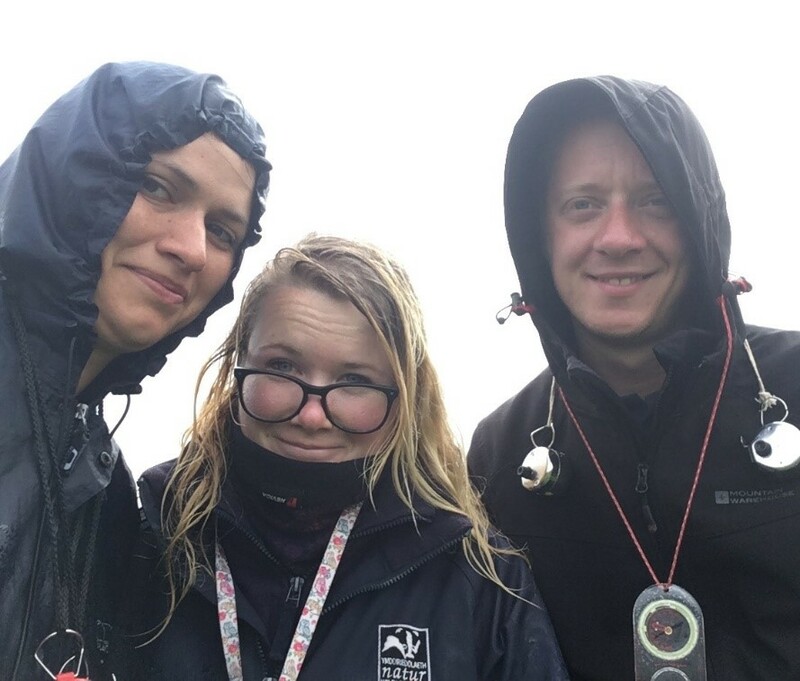 For the new Wardens we would like to offer the following advise: the job comes with some hugely rewarding moments and the experience that you can gain on an island like this, working with seabirds and people, is literally second to none. However, don't expect to get through any meal without being interrupted, or for the phone to stop ringing, and you'll be alright. Inevitably, we have made mistakes and not everybody has agreed with everything we have done, but at least we can say we have given it our all and tried our best for the island, the Trust, the visitors and, most importantly, the wildlife. 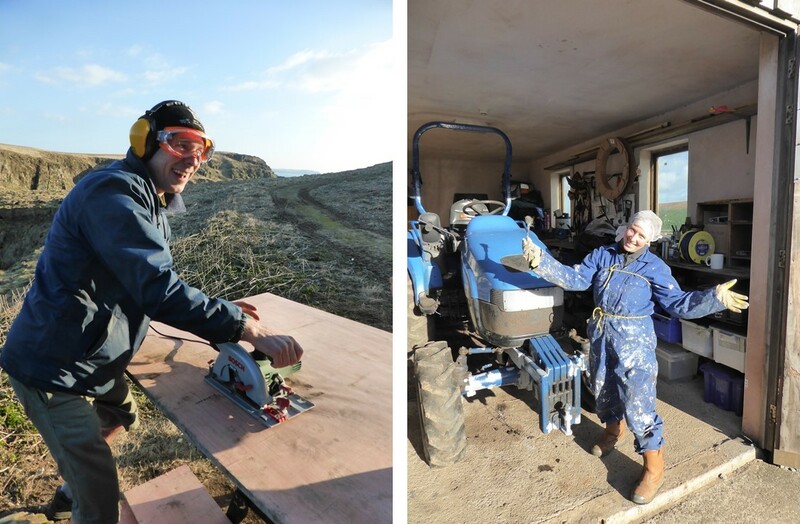 Our most memorable moments have included: the return of the seabirds in spring, helping with Guillemot work on the Amos, going to sleep with the sound of the shearwaters at night, freshly caught Mackerel and Pembs potatoes (thanks to Treehill farm), the Skomer Games, curry nights with our staff, working with the seals, helping the researchers with their studies and hundreds of hours spent on our boat counting seabirds. Thank you to everyone who has welcomed us here and most of all to Skomer Island! We will cherish our memories and never forget these exceptional years.